(Newser) – President Trump took to Twitter on Sunday to issue a warning to America's neighbor to the south. "Stop the big drug and people flows, or I will stop their cash cow, NAFTA," Trump wrote, as CNBC notes, before he explicitly linked the renewed trade negotiations to his signature campaign promise by adding: "NEED WALL!" The US, Canada, and Mexico are currently renegotiating the North American Free Trade Agreement at Trump's insistence. Trump says NAFTA is bad for the US. 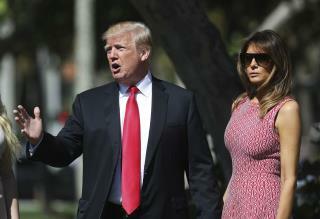 "Mexico has got to help us at the border," Trump told reporters before he attended Easter services at an Episcopal church near his Florida home, per the AP. "If they're not going to help us at the border, it's a very sad thing between our two countries." Trump said. "A lot of people are coming in because they want to take advantage of DACA." Isn't he warning the wrong country? Shouldn't he be warning America? You know - the major drug consumers of the world? I don't know what he'd threaten them with, though. He's already president. If we deport all the Mexicans, who's gonna be left to build the Great Wall of Trump?